When it comes to your bathroom design project, you could opt to start from scratch with new flooring, a bathroom vanity and other bathroom accessories, but you should take a look at your lighting before you implement a new scheme. A refreshing take on your room's use of natural light could revitalize the look of your space and limit the amount of work you'll need to put in. First and foremost, you should look to your windows to see if there is any way of improving the room's light filtering ability. Cell shades are wonderful options for the colder weather, and they can help to improve the insulation in a bathroom and can be found in a number of thicknesses. In warmer weather, you can always opt for a lightweight fabric shade to allow more light to filter in. The other accents in your bathroom, ranging from your shower curtain to bath rugs, should be in light or pastel colors to add warmth to the space. Lastly, choose a wall color in a similar hue to bring the whole aesthetic together. Once these changes have been implemented, you can decide whether or not to push forward with large-scale additions. 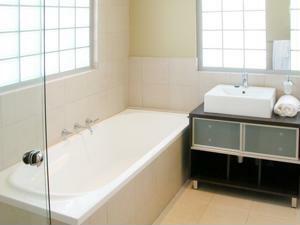 What other small tasks should a person look into before a remodeling project?